Posted on 14-04-2014 by Peter W. Szabo & filed under Fire-and-Forget. What Needs To Be Solved? We need to make sure, that the text of our websites can be easily read and understood. This is one of the most important goals of user experience design. Unfortunately it is not among the easiest ones, mainly because it is influenced by many things. Note, that many sources discuss readability and legibility separately. I find this separation highly impractical, because many factors of readability and legibility are common, and influence both. Even hard to measure abstracts, like the motivation of the reader will influence both. 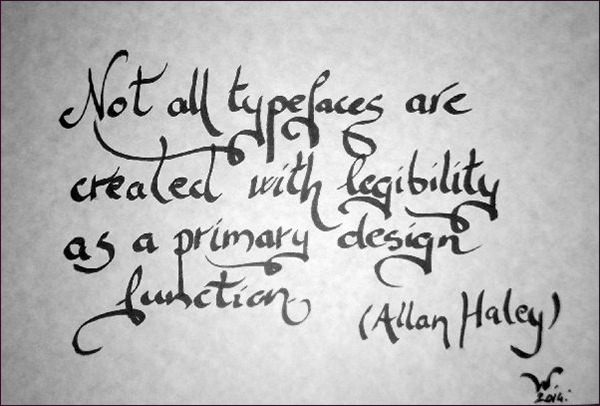 Typography enthusiasts often simplify the problem of legibility to the choice of font family. Truth to be told, the font family plays a major role in legibility. Allan Haley emphasizes that “not all typefaces are –or should be– created with legibility as a primary design function”. The easiest solution is to pick a font from the so called “websafe” font list. This roots in the “Core fonts for the Web” project by Microsoft. The projects goal was to create a standard pack of fonts for the Internet. The project was terminated in 2002, because of frequent EULA violations. (People used the fonts in commercial software, and most of the time they repackaged and modified them.) Fortunately they are still included in both Microsoft 8 and Mac OS X. With the dawn of smart phones, and mobile operating systems, the list of web safe fonts narrowed. Fonts considered web safe in the past are no longer present in all devices by default. This is quite a good thing in some cases, that where a typographical disaster anyways, like Impact and Comic Sans. Others are monospaced, and should be used only in very special scenarios, like rendering ASCII Art or screenplays scripts (for example Andale Mono or Courier). That is six font families to choose from… or rather five. While officially Arial is based on Monotype Grotesque it is so similar to Helvetica that it is indistinguishable for the untrained eye. Plus Helvetica was not part of the “Core fonts for the Web” project. If you can’t decide, set the whole text with each font (or the ones you prefer), and ask others what is better on the screen. Printing the text with different fonts is a bad idea, because the legibility of a given font is different on screen and on print. Obviously there is no definitive answer to the question: “What is the most legible font on the face of Earth?” But then again, if you want a quick win, go with font-family:”Helvetica Neue”, Helvetica, Arial, sans-serif. The “Helvetica Neue” is not guaranteed to be present on each and every device, so add a fall back option. There are some old cell phones, that have only two font families in them, sans-serif and serif, that is the reason to add that at the end of the fall back list in CSS. If you want to use any font, not just those five mentioned above yours uses will need to download the fonts your site uses. While in the late 90’s there where sites that included a link on their home page to the font download, that is something you should definitely avoid. A bit more advanced, solution is the @font-face CSS property. Some older browsers do not support the @font-face rule. (Internet Explorer 8 and earlier versions, not to mention older smartphone browsers.) But there is an even bigger issue with this. You have to own the font license, and in that license it should be allowed the @font-face usage. This can be quite costly. Moreover this increases the bandwidth costs of your hosting. So I would not recommend @font-face, unless your company has his own font, that must be used on the website. Paid solutions quickly emerged for this problem. Typekit, WebINK, Webtype, Fonts.com and similar services exist and have quite a few subscribers, so this might be the way to go, if you want a really custom and unique looking typography. In some cases you need to pay a yearly fee based on the number of unique visitors / month and get access to all fonts in their library and you can use on any site, while in other case they limit the number of fonts you can use on a website, and number of websites you can have. When choosing such a service, make sure the read the fine print. Some services measure number of pageviews/month, while others number of unique visitors / month. 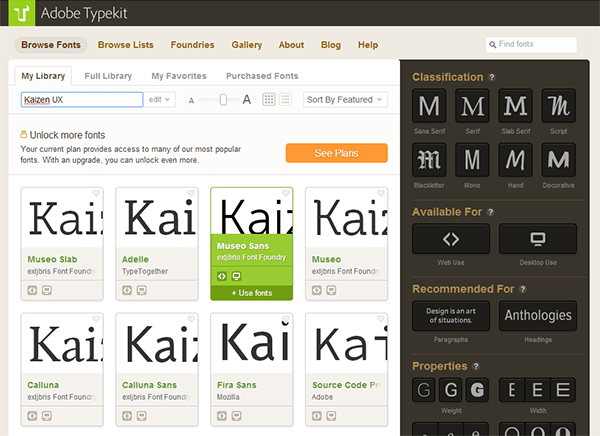 Typekit was one of the most popular service of this kind, even before it was acquired by Adobe in 2011. It has an easy to use and quite newbie friendly interface. You can select fonts based on classification (for instance if you only wish to see Serif fonts or Script fonts), but more important is the ability to click the „Paragraphs” option in the „Recommended For” section. Even if you want a unique looking heading, most of the time you should pick a paragraph font. If your budget allows by all means go with a paid solution, to enrich the web with typographic marvel. The said solutions solve the legal and hosting problems for you and provide an easy to use interface for choosing the best looking font for the task. If you want best of both worlds, read on. https://www.google.com/fonts is where you can find 600+ font families (632 at the time of writing this blog post) totally free, and usable on any website, hosted by Google. All of the fonts you find there are Open Source, so you can even modify them. In a font family you can find many different weights and styles. The styles (italic and oblique) should be used to emphasize parts of the text, but almost never to set the whole text with it. From a readability standpoint they are inferior to the normal styles. The same stands for text-decorations (underline, overline, etc) and font-variant (the only font-variant currently in CSS is small-caps). So avoid those for the main body of the text. Font-weight is however can be tempting to be set to light or semi-bold. It is common knowledge that bold or extra bold is for strong emphasis, not for main text. But some even claim that semi-bold can be more readable in certain situations. For example, when the contrast between the background and the text color is low. Light gray text on a darker gray background is one of those situations. I would avoid those situations in the first place, but if for some reason (mostly client desire) can’t be avoided I would certainly try to play with font-weights. But then again 99.99% of the time you want to go with normal (400) font-weight. It is called regular or plain in some cases. Thanks a lot for sharing it on delicious. I’m glad you find it relevant. Thanks for the comment.